Every teacher tussles with what’s the best way to reach a kid – to have them digest and remember what they’re learning. Even parents struggle with that. One New York City-based company had a wild idea — teach kids through rapping. Some people didn’t like the idea, or even laughed at it, but we found a Texas principal who said it works, reports CBS News correspondent David Begnaud. It’s all part of an educational program called Flocabulary, which creates online videos about everything from math to social studies. Rapper Ike Ramos working with students. “It’s a way to get out my emotions and feelings and expressing it in a way through music, which I really enjoy,” Juan said. Juan’s classmate Allison Mathew was a little embarrassed at first. “You kind of dreaded it, didn’t you?” Begnaud asked. “Yes, I did,” Allison admitted. “Teachers always say that they hear students mumbling the song under their breath during exams or during quizzes or whatever,” said Ike Ramos, a rapper who has shared the stage with Lil Wayne and the Wu Tang Clan. “You know, what’s powerful about music is that it actually helps with the encoding of that information into the brain but also the retrieval of that information,” Ramos said. 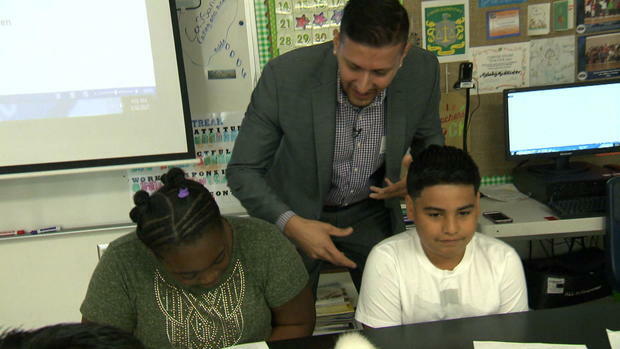 These days, Ramos — who’s a former teacher and principal — fuses beats with educational content. “The curriculum developers are very involved throughout the whole process,” said Blake Harrison. “Even if we’re making the song for a third-grader, it has to pass the test of, can you play it basically at a party and, you know, will people react to it and say, ‘Oh, this is good music,'” Harrison said. “I tell my teachers all the time, ‘You are competing against Twitter, Instagram, YouTube and Facebook, so you better bring it. When we were growing, up our families, you know, we sing all the lyrics on the radio. And they would always say, ‘If you can learn that then you should be able to learn your lesson.’ That’s what my grandmother used to always- she told me that all the time,” Williams said. “I completely understand, but if you look at hip-hop by words per minute, it’s actually the wordiest genre,” Ramos said. “We don’t all look alike, and we don’t come from the same backgrounds and whether they think you’re cool or you- they think you’re crazy, you know, it pulls ’em in right away,” McAllister said. Next articleArchery: Inherently Cool OR Irresponsibly Dangerous?